We offer full and part time daycare/preschool for children ages 6 weeks thru Kindergarten. We are open M-F 6:15am -6:00 pm. The children are served breakfast, lunch and 2 snacks prepared in our commercial kitchen following USDA guidelines. Check out each of our classrooms on their links below to see pictures, descriptions, lesson plans, schedules and newsletters. We offer pat-time pre-k for 4 yr olds M, T, W from 9:00-12:00. We have a 3 yr old class Th, F from 9:00-11:30. Check out the link below to learn more about our program! We offer before and after school care for children Kindergarten thru 4th grade. Nordonia Hills public school buses transport to and from Northfield Elementary and Rushwood Elementary, and from St. Barnabas in the afternoon. 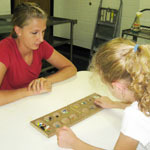 We also operate a full summer camp program with lots of neat activities and field trips. Check out our link below!